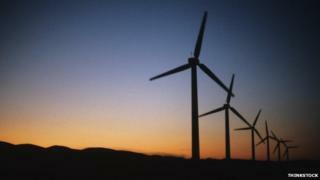 A plan to build a wind farm in Dumfries and Galloway has attracted almost 600 objections. Councillors have been recommended to back proposals for a development at Mochrum Fell in the Stewartry. Developers Falck Renewables Wind Limited want to build eight turbines on the site, west of Corsock and north-east of Parton. Objectors have raised concerns about issues including the effects on tourism and local wildlife. A total of 591 individuals and organisations have opposed the bid, with 24 in support. They have also expressed worries about the cumulative impact of the scheme when taken with other consented and proposed wind farms in the area. An earlier plan to build 11 turbines on the site was rejected by the council which said it was out of character with the surrounding landscape. Under the new plans, seven turbines would be 126.5m (415ft) high and one would be 10m (32ft) shorter. In a report to next week's planning applications committee, officials said the amended proposals are now acceptable in landscape terms.